Colby Covington is expected to challenge Kamaru Usman for the UFC welterweight title later this year. Although Usman presents his own challenges to Covington, ‘Chaos’ is already eyeing his next potential fight. That fight would be against current UFC lightweight champion, Khabib Nurmagomedov. Covington recently discussed a potential catchweight bout with ‘The Eagle’, where he insinuated that Khabib would be the easiest fight of his career. “Yeah, I mean it’s an easy fight. He’s already asking to fight Georges St-Pierre in between welterweight and lightweight,” Covington said in a recent interview with Submission Radio (transcript via BloodyElbow). I can make in between welterweight and lightweight because I’m not a big welterweight. It’s going to be more rewarding to smash two of Ali [Abdelaziz]’s biggest clients and just leave him crying. ‘Chaos’ last fought back at June’s UFC 225 event, where he defeated Rafael dos Anjos to capture the promotions interim welterweight title. Nurmagomedov, meanwhile, remains undefeated and last fought at UFC 229 where he submitted Conor McGregor in the fourth-round. It is expected that Nurmagomedov will return in September where he will most likely take on the winner of Dustin Poirier vs Max Holloway. Meaning, this fight most likely won’t happen this year, if it ever does come to fruition. 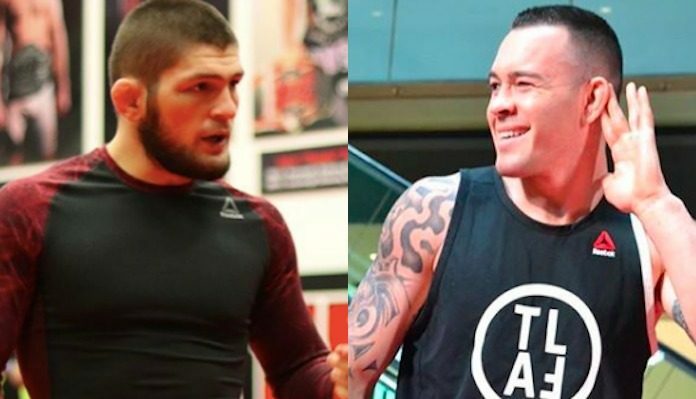 Do you agree with Colby Covington that Khabib Nurmagomedov would be his easiest fight to date? Sound off in the comment section, PENN Nation!